Shortly after the advent of the Kura–Araxes complex in the mid–4th millennium, the western Caucasus developed its own tradition of dolmens, or megalithic buildings for the dead, as early as 3250 BC. They are often associated with the megalithic traditions of western Europe, and seen thus as a global phenomenon, although they were restricted in this region to a small area in the north-eastern Pontic coast. Dolmens were built of well-squared, heavy stone slabs, placed on their edges and fitted together with precision, positioned to maximise the sunlight on the façade; most facing southwards, some eastwards. Most dolmens were used for multiple interments, and included men and women, young and old, and funerary provisions (Sagona 2017). Figure 37. Tombs of the Novosvobodnaya type. 1 – kurgan. 1, 2 – kurgan 2 – excavations N. I. Veselovski; 3 – burial site Klady 31/5; 4 – burial ground klady 28/1 (according to Rezepkin). Modified from Korenevskiy (2012). The latest stage of the Maikop–Novosvobodnaya historical community is represented by the Novosvobodnaya dolmens, with a span ca. 3300–2800 BC, overlapping with the beginning of west Caucasian dolmens. 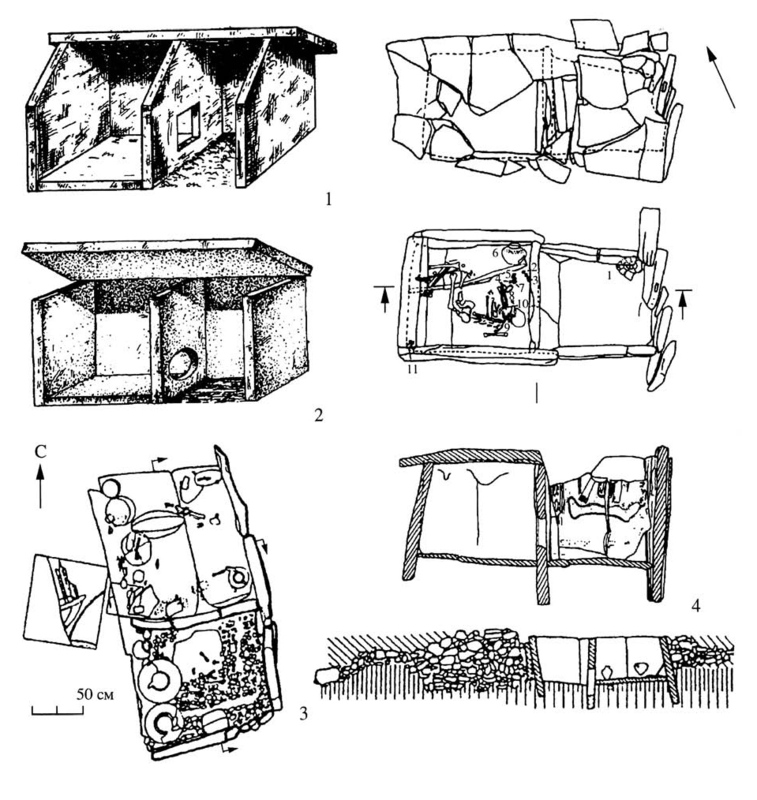 Unlike the Maikop barrow burials, two rich tombs at Novosvobodnaya were constructed of stone slabs, in a plan that resembles those of the Dolmen tradition, but with distinct characteristics (Figure 37): the interior design and plans differ, with a pair of slabs placed close enough to form a narrow gap, separating two compartments, a paved burial chamber and an antechamber. Masonry is more precise, and large slabs form the roof and overhang the entrance, which faces south-east. The entire structure is concealed beneath a barrow of stones defined by a kerb (Sagona 2017). They were not used for collective burials, and the deceased were placed on the right side of the chamber, accompanied by a rich assemblage, although it did not reach the high level of Maikop kurgans. During this period, there is a decline in the number of objects made of precious metals, and an increase in copper objects, with an improvement in copperworking seen in elaborate forms of weapons and tools. Jewellery and metal (golden, but also silver) beads, on the other hand, increase in this late phase (Sagona 2017). Ceramic evolves from the limited Maikop repertoire to tall-necked jars with incised decoration. New sets of woodworking and leatherworking tools appear, and the lack of impurity in the copper points to an origin of the metal ores in the Balkans. Spearheads from the northern Caucasus are similar to those from the Kura–Araxes culture found in the southern Caucasus and Arslantepe. Their subsistence economy is assumed to be based on stockbreeding of ovicaprids, cattle, and pigs (Sagona 2017). The other tradition of the area, the Colchian culture, probably developed from indigenous groups that occupied the wetlands and lowlands for over two millennia. By 2900 BC, the Kura–Araxes culture was spread throughout much of south-west Asia, which suggests that they competed against northern Mesopotamian societies. The widespread dissemination of this material culture, along with the small size of most sites, the ephemeral nature of their settlements, and their presence in both fertile lowlands and seasonally-inhospitable highlands, suggest that they were formed, at least in part, by mobile pastoralists (Alizadeh et al. 2018). Kura–Araxes groups primarily inhabited mountains and intermontane valleys of the surrounding highland zone, and they had access to metals, precious and semi-precious stones, stones for tool making, wood, and animal products; resources that were abundant in the mountain area, and essential for Mesopotamian societies. Metallurgical sites like Köhne Shahar suggest that a developing complex of exchange networks and interaction with specialised craft economies facilitated the culture’s expansion, by filling a supply vacuum created by the collapse of Uruk colonies (Alizadeh et al. 2018). In Arslantepe, around 3000 BC, the Palatial system collapsed, apparently by a big fire that destroyed the palace and the whole centralised state forever, including the Mesopotamian-type society, administrative system, and officials. This event seems to be related to the gradual expansion of Kura–Araxes pastoralists, whose seasonal occupation of the site eventually turned into a permanent residence for their chiefs (Frangipane, Manuelli, and Vignola 2017). New settlements were established, with an outstanding area on top of the mound, consisting of a likely chief hut (ca. 2900 BC) separated from the rest of the settlement by a timber palisade, and an imposing mudbrick building with a reception hall, and store rooms full of vessels and foodstuffs. Pottery had simple shapes, resembling those of north-eastern Anatolian and southern Caucasian origin, no longer central Anatolian, although decoration and technology corresponded to the previous tradition (Frangipane, Manuelli, and Vignola 2017). The changes from a seasonal occupation to a rural village with mudbrick houses and pottery of the post-Uruk tradition happened ca. 2800 BC, with both communities—the traditional, sedentary one, and the pastoral itinerant community from north-east Anatolia and the southern Caucasus—apparently negotiating, interacting, and clashing, with either side alternatively succeeding, taking control and possession of the mound. The identity of the two groups must have been clearly perceived, and no evidence is found to suggest cultural inclusion or mixing, whereas episodes of conflict are evident (Frangipane 2015). The social instability and political upheaval are also noticed by the emergence in the region of human sacrifice, usually a resource of hierarchical social structures that accompanied early state-formation processes. In the vacuum of political centralisation that followed the withdrawal of Uruk material and the appearance of Kura–Araxes, instability among smaller polities must have created thus the necessary environment for the introduction of human sacrifice. With the appearance of vast administrative state systems in southern Mesopotamia in the next millennium, this practice disappeared again from the archaeological record (Hassett and Sağlamtimur 2018). Novosvobodnaya (ca. 3600–3300 BC) and late Maikop samples (ca. 3300–3100 BC) in the northern Caucasus foothills also show continuity of ancestry with Maikop samples, falling among the Armenian and Iranian Chalcolithic individuals. Important phylogenetic differences are seen, though: Novosvobodnaya shows hg. J2a1-L26 in two samples from Klady, one of them J2a1a1a2b2a3b1-Y3020, and the other J2a1a1a2b2a3b1a-Y11200 (xY30811-, Z30682-), the same haplogroup found previously in Eneolithic Caucasus (see above §iv.4. Late Middle Easterners), and found today mainly in Northeast Caucasian populations; and G2a2a-PF3147 (expanded with Anatolia Neolithic farmers) in one sample from Dlinnaya Polyana; whereas Late Maikop shows hg. L-M20 in one sample from Sinyukha and two from Marinskaya, probably all L2-595 (formed ca. 21000 BC, TMRCA ca. 3200 BC). Haplogroup J1-L255, found previously during the Mesolithic, is also reported for Late Maikop in Marinskaya. Two late Maikop outliers from the north Caucasus steppe show a higher proportion of Anatolian and Iranian farmer-related ancestry. This may have been driven either by Pontic–Caspian steppe migrations, or by the admixture with local Caucasus populations of AME ancestry. The presence of haplogroup R1a1b-YP1272, a typical eastern European lineage, in a sample from Sharakhalsun (ca. 3230 BC), suggests the former as the most likely explanation; the sample from Ipatovo (ca. 3260 BC) shows hg. T1-L206, a typically Middle Eastern lineage (Wang et al. 2019) . This Caucasus Eneolithic-like ancestry is also continued in Kura–Araxes (Wang et al. 2019), in early samples (ca. 3500–3100 BC) from the south (Kaps, Armenia), one of hg G2b2a2-FGC2964 (formed ca. 13700 BC, TMRCA ca. 1100 BC), found previously in an Iranian Neolithic individual ca. 7300 BC; and in later Kura–Araxes samples (ca. 3100–2800 BC) in the north-east (Velikent, Dagestan), one of hg J1a2b1-Z1842 (formed ca. 5800 BC, TMRCA ca. 4000 BC), a haplogroup probably found later in a west Anatolia Bronze Age sample (ca. 2500 BC), and widely distributed in modern populations of the Middle East, which supports its expansion with Kura–Araxes peoples, and its association with modern speakers of Northeast Caucasian languages. Increased CHG ancestry (ca. 60%) is also seen in other three Early Bronze Age individuals from the Kura–Araxes culture in Armenia dated ca. 3300–2500 BC (Lazaridis et al. 2016), with a late sample from Kalavan (ca. 2550 BC) showing what seems to be the latest finding of hg. R1b1a2-V1636, already part of a non-Indo-European community (see above §iv.2. Indo-Anatolians). An outlier from the Zagros Mountains in Hajji Firuz Tepe also shows elevated Steppe-related ancestry, and clusters between Kura–Araxes and Yamna samples (Narasimhan et al. 2018), consistent with the incorporation of North Caucasus-like populations within the expanding Kura–Araxes groups. The radiocarbon date published (ca. 2465–2286 BC) is compatible with that interpretation, although the collapse of different archaeological layers in the same site has yielded unreliable dates for (at least) one other sample, and it may therefore correspond to a much later date, in particular the Late Bronze Age – Early Iron Age (see §viii.14. Caucasians and Armenians). Based on the territorial expansion of the Kura–Araxes culture, and on the subsequent groups that emerged in its core territories after its demise, the language spread by these southern Caucasian peoples was probably Hurro-Urartian, which may support a connection with North-East Caucasian languages in a hypothetic Alarodian group (Diakonoff and Starostin 1988), at least from a genetic point of view. Territories of the north-western Caucasus, occupied by Maikop, Novosvobodnaya, and Dolmen traditions, would probably then represent evolving North-West Caucasian-speaking peoples.